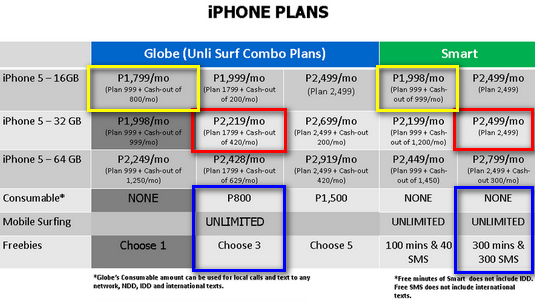 Globe vs. Smart iPhone 5 Postpaid Plans Comparison Tables, Prepaid Prices and Monthly Cash-Outs Battle! Just like what happened in 2011 when they launched their Apple iPhone 4S bundles, Globe Telecom and Smart Communications will again officially make their iPhone 5 Postpaid Plans available to the public this year at exactly the same time as each other. A year back, the clash transpired on the 16th of December. Now, the head-to-head battle will happen on the 14th. 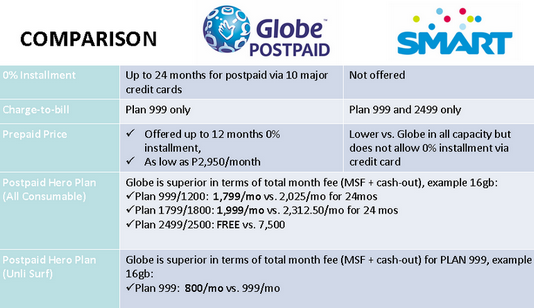 If you're close to pulling your hair out (or consulting your favorite tarot card reader) trying to decide which subscriber registration line you should join this coming Friday, I bet these Globe vs. Smart iPhone5 Postpaid Plans Comparison Tables (courtesy of Globe) will truly save your life - or at least your sanity. As I've mentioned in a previous post, Smart Communications currently offers the lowest prices for iPhone5 prepaid kits or the handset without any contract. It appears that Globe Telecom won't try to match their competitor's prepaid prices but the company nonetheless accepts 0% installment for 24 months using credit card to lighten the load on top of free SuperSurf for one month. That's fair enough, I think. Looking at the table, it's clear that Globe Telecom offers the lowest monthly fee for iPhone 5 bundled with unlimited mobile internet. Should you go with Globe, you need only pay Php 1,799 per month (that's Plan 999 plus Php 800/mo cash-out) to own Apple's flagship smartphone versus vs Php 1,998 with Smart for its Plan 999 with Php 999/mo cash-out. This year, Smart is particularly proud to offer iPhone 5 32GB variant for free via its iPhone Plan 2499. I have to admit I got very excited when I learned that. But when I saw this table, the excitement was kinda doused. Apparently, Globe Telecom is likewise offering iPhone 5 32 GB at Plan 1799 with Php 10,080 cashout that can be paid through credit card at 0% installment for up to 24 months. Thus, the effective monthly fee with Globe is just Php 2,219, which is even lower than Smart's Plan 2499. These freebies allow you to personalize your Plan depending on your unique needs. For example, if you have a loved one that you need to stay in touch with 24/7 via calls and text, then you might want to include Freebie E in your list. The coolest part is that you can choose a Freebie more than once depending on your Plan. 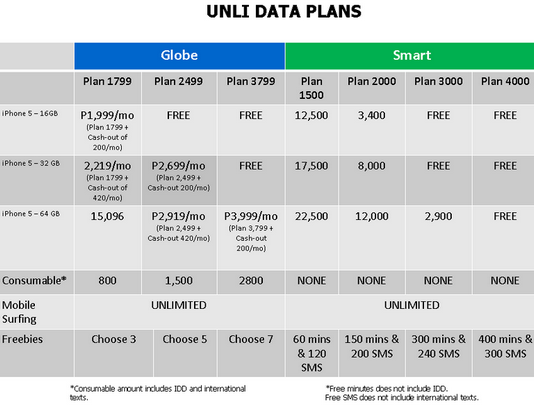 Finally, we have the Unli Data Plans comparison. Here, the lowest plan that gives you an iPhone 5 for free is Globe's Plan 2499. Smart offers iPhone 5 32GB for free at Unli Data Plan 3000 but Globe's effective monthly fee for Plan 2499 giving you the same device is just Php 2,699. Both of these plans will give you unlimited mobile internet but Smart bundles an additional 300 minutes and 240 SMS to local networks only while Globe gives you Php 1,500 consumable for local and international calls and texts on top of five freebies. So there you go! I hope these tables made it easier for you to make a decision. Let me know which network you've decided to get your iPhone 5 from via our comments section. PS: TechPinas, of course, is open to posting Smart Communications' version of iPhone 5 Postpaid Plans and Prepaid Kits Comparison Table if and when they decide to share it with us.